VEI PRESENTS "CANNON"...ONE OF THE MOST CRITICALLY ACCLAIMED TELEVISION SERIES OF THE 1970S. 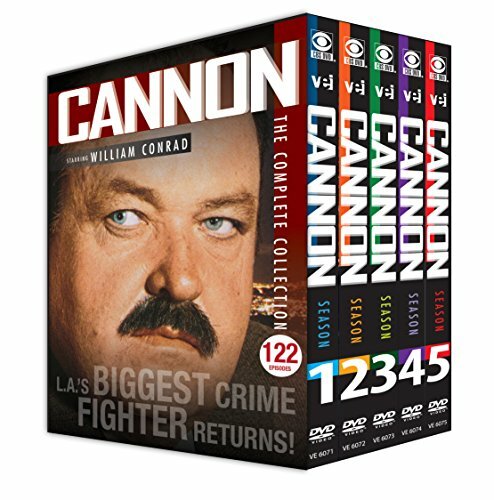 THIS DVD COLLECTION INCLUDES ALL FIVE SEASONS OF THIS HARD HITTING AND LONG RUNNING SERIES STARRING WILLIAM CONRAD AS THE DAUNTING AND FEARLESS PRIVATE DETECTIVE FRANK CANNON AND FEATURING SUCH GUEST STARS AS NICK NOLTE, ROBERT LOGGIA, TINA LOUISE, DAVID JANSSEN, STEFANIE POWERS AND LESLIE NIELSEN. THIS AUDIENCE FAVORITE WAS CREATED AND PRODUCED BY QUINN MARTIN, WHOSE OTHER AWARD WINNING PRODUCTIONS INCLUDE BARNABY JONES, THE STREETS OF SAN FRANCISCO AND THE FUGITIVE. IT ALSO ATTRACTED NOTABLE DIRECTORS, INCLUDING RICHARD DONNER (LETHAL WEAPON, SUPERMAN AND THE OMEN) AND LEO PENN (STAR TREK, CAGNEY & LACEY, KOJAK). FRANK CANNON ISN'T YOUR AVERAGE, STRIKINGLY HANDSOME TV PRIVATE DETECTIVE. HE IS EVERY MAN, WHO EVERY MAN BELIEVES HE COULD BE. AND WHEN PUT TO THE TEST, HE IS MORE THAN EQUAL TO THE TASK OF BRINGING THE UNJUST TO JUSTICE. THIS OUTSTANDING DVD COLLECTION INCLUDES OVER 120 EPISODES OF THIS GOLDEN GLOBE® AND EMMY® NOMINATED SERIES. If you have any questions about this product by Visual Entertainment Inc., contact us by completing and submitting the form below. If you are looking for a specif part number, please include it with your message.